Although Ottmar Mergenthaler was born in Hatchel, Germany in 1854 and received his early training as a watchmaker in Württemberg, his creative career started and flourished after he arrived in Washington, D.C. in 1872 at the age of eighteen. His first job could not have been more serendipitous: he started work in the scientific instrument shop of August Hahl, his step-cousin and the son of his former master in Germany. Much of the shop’s work was the making of working models of new inventions, which were then required by the U.S. Patent Office. For the next four years, Mergenthaler’s skill and ingenuity were applied to this work, and his special talents were soon recognized. Ottmar Mergenthaler, aged 25, in an 1879 photograph. When Hahl transferred his business to Baltimore in 1876, Mergenthaler accompanied him. One of his first projects there was to correct the defects of a machine intended to produce printing by a combination of typewriting and lithography. The idea for the invention came from James O. Clephane of Washington. Although the machine never yielded satisfactory results, it set Mergenthaler on the path to revolutionizing the casting of type. Clephane then suggested a machine that could punch indented characters into papier-maché, producing type through a stereotype casting. Mergenthaler, after a short examination of the idea, doubted its practicality, but on Clephane’s urging continued. Mergenthaler completed the machine in late 1878, but in spite of much effort Mergenthaler’s misgivings proved correct. Clephane and his associates worked without Mergenthaler until they abandoned the project in 1884. He next realized—somewhat to the dismay of his backers—that single brass matrices would produce superior results, and began work on a new machine. It was tested in the summer of 1885, and was a complete success. A new company called The Mergenthaler Printing Company was organized, and with strong financial backing, it was decided to build twelve of the new machines. The first machine completed was sent to the New York Tribune, where it was used to set part of the newspaper of July 3, 1886. 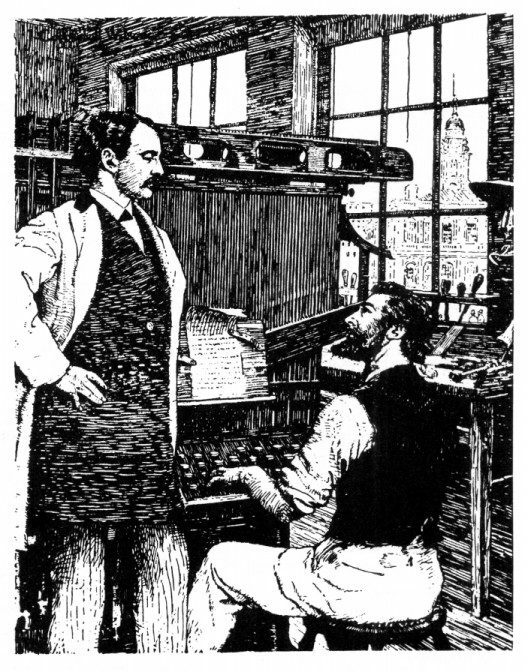 Mergenthaler demonstrates the “blower” Linotype for Whitelaw Reid of the New York Tribune in July, 1886. Drawing by J. Coggleshall Wilson. Before the last of the twelve machines had been completed, Mergenthaler had added nine patented improvements. Business control of the venture passed into the hands of a group of newspaper owners, who, seeing big profits in the offing, ordered that 100 more machines be built at all speed. Mergenthaler, who saw the possibility of further important improvements, pleaded for time but was overruled. He proceeded with the work, struggling with the problem of producing brass matrices on a commercial scale by means of steel punches, which were all engraved by hand. This was a bottleneck, and he began work on a punch engraving machine. He had not yet finished this work when the Benton pantograph machine was completed, and Mergenthaler stopped work on his own. Trouble between the backers (headed by Whitelaw Reid of the Tribune) and Mergenthaler had been brewing for some time; now there came a split. 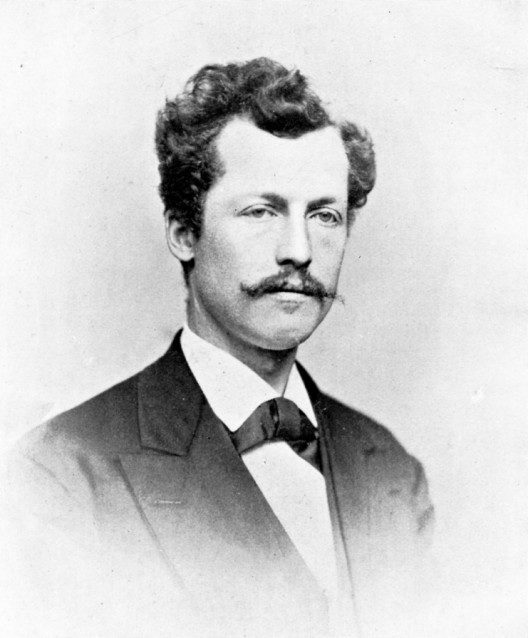 After many bitter letters, he resigned in 1888 and although the syndicate continued to manufacture the Linotype machine, his own company in Baltimore, Ottmar Mergenthaler & Co., continued to make parts and to build the blower machines for the syndicate. 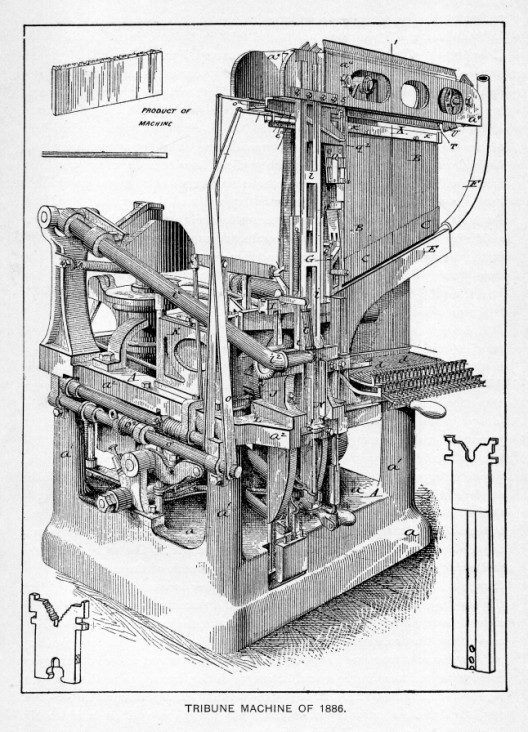 The “blower” Linotype of 1886, with a cast slug shown at top, matrix on left, space bar on right. Meanwhile Mergenthaler devised such radical improvements that in 1891 the syndicate joined with him again to form The Mergenthaler Linotype Co., under the direction of Phillip T. Dodge. Bitter feelings persisted, however, and in 1895 Dodge sent a letter to Mergenthaler in which he requested that the inventor allow the company to drop his name from the company title, on the grounds that it was too long, too time-consuming to write out, and subject to misspelling. Mergenthaler refused in a scathing letter which ended: “Hoping to be spared the intended humiliation, I am, Yours Truly, Ott. Mergenthaler.” His name remained for the next 88 years (with no apparent deterrent to sales) until the company, in 1983, finally accomplished the action initiated in 1895 by Dodge. Constantly driving himself to perfect his invention, Mergenthaler contracted tuberculosis in 1894 and began a desperate struggle against the disease. In 1897 he fled to the benign climate of New Mexico, but, sensing he had little time left to tell his story, he and his children’s tutor, Otto Schoenrich, began his biography. The book, though called a “biography,” might better be considered an autobiography. It was published anonymously in Baltimore in 1899, a few weeks before Mergenthaler’s death at the early age of 45. It is a slim book full of bitterness at his betrayal by the syndicate, and quiet pride at his accomplishment. In 1911, when the original Linotype patents expired, the Intertype machine appeared on the market. It was essentially the same as the Linotype, but with some changes and improvements. Both machines used the same matrices. Today, more than 125 years after its introduction, there is no doubt about the significance of the Linotype in the history of printing. The invention swept all the typesetting machines before it, sharing honors only with the Monotype machine of Tolbert Lanston. In the field of newspaper composition, it was supreme. In 1901, 8,000 machines were in use, and by 1954, 70,000. Although the advent of phototypesetting and then computer composition made the Linotype outmoded, it is unlikely that it will ever be completely extinct. In any case, the company that Mergenthaler began continued into the age of the computer with a leading photocomposition system, the Linotype CRTronic desktop digital typesetter. The day had arrived that Mergenthaler alluded to in 1885, “a method of printing . . . which requires no type at all,” but in the intervening century his inventions made possible the information explosion whose effects are still being felt. Mergenthaler, Ottmar and Otto Schoenrich. Biography of Ottmar Mergenthaler and History of the Linoype, its Invention and Development. Baltimore, 1899. Reprinted with additional material edited by Carl Schlesinger. New Castle, Delaware, 1989. Kahan, Basil. Ottmar Mergenthaler: The Man and his Machine. New Castle, Delaware, 2000.